A complete in-depth Fire Marshal/Fire Warden training course that will equip you with all the knowledge you need to become a fully trained Fire Warden or Fire Marshal. IOSH and RoSPA approved & CPD accredited training helping you work towards compliance with the Fire Safety Order 2005 and other current legislation. A comprehensive, in-depth Fire Warden eLearning course can equip you with the knowledge needed to become a fully-trained Warden or Marshal. This programme provides complete knowledge, which coupled with correct experience, leads to competence in this role. 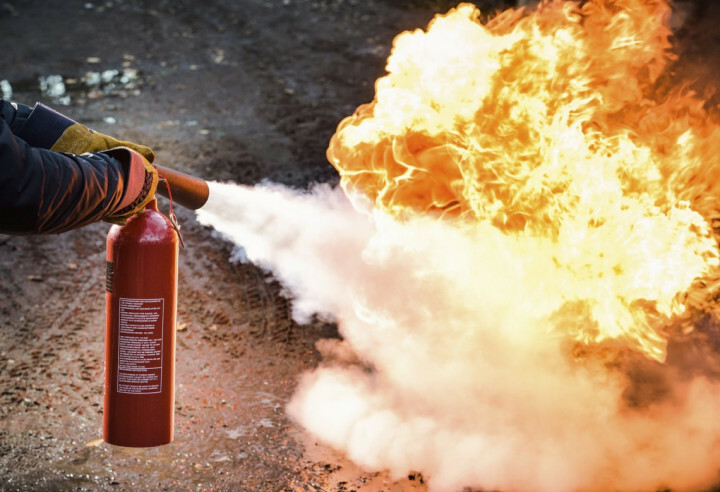 This Fire Warden training course covers your duties under the latest fire legislation, as well as looking at fire-prevention measures, the correct use of fire extinguishers, and how to organise a safe evacuation. Having delivered this programme more than 100,000 times, this is one of our most popular courses and is crucial for any workplace’s safety. This training course is broken down into 5 sections: the nature of fire and how it occurs, fire signs (and what they mean), your proactive duties as a fire warden, your reactive duties and what fire extinguishers to use and when. This course can be used in conjunction with our Fire Awareness Training. The Fire Marshal & Warden Training course is broken down into 5 sections. To begin, we cover the nature of fire – how it works, and the different ways in which it can spread; we also cover smoke and the dangers it poses. This introduction is important for Fire Wardens so they learn what behaviour to expect from fire and smoke and how important it is to help educate their colleagues too. It’s the starting point for Fire Wardens, in the process of keeping the workplace safe. Health and safety signs can save lives – they are used to communicate important messages to prevent injury or give instructions in an emergency. This section identifies the different types of signs you may see in the workplace; we define what they look like, what they mean, and our Traffic Light System provides a simple way to remember the different types. Fire Wardens are at the forefront of fire-related health and safety in the workplace, and they should be able to help educate colleagues about signs related to fire safety. This section looks at the first half of a Fire Warden’s Proactive Duties, which are routine, preventative tasks that need to be completed to reduce the risk of a fire starting. This includes arson awareness, alarm and system maintenance, risk assessments, and managing ignition sources, flammables and combustibles. We also cover The Fire Safety Order (FSO). The second half of a Fire Warden’s duties are covered in this section; these are the REACTIVE duties, which include the actions that need to be taken during fire drills, emergencies and an evacuation procedure. This section also covers clear leadership and human behaviour – a warden needs to know what to expect from their colleagues, and what their colleagues will expect from them during drills and emergencies. To conclude our programme, this section teaches warden’s about when it’s safe to fight a fire, and when it’s NOT. We provide demonstrations on how to use the five common types of fire extinguisher, as well as fire blankets. Warden’s learn about the different “Classes of Fire”, and which extinguisher to use on each class. To finish this Fire Warden Training course, you need to complete a multiple-choice, 20-question test. In addition, we will also supply questionnaires throughout the course to encourage the highest levels of user engagement. Upon successful completion, you will receive a printable certificate. You can print this certificate from your LMS (Learning Management System) as well as access training progress and course results. The LMS also stores all your company training results, so you have a record of proof of your commitment to ongoing legal compliance. Your Fire Warden Certificate includes your name, company name (if applicable), name of course taken, pass percentage, date of completion, expiry date and stamps of approval or accreditations by recognised authorities. Based on 5,359 real user reviews. Clear and accurate training, it wasn't boring. Read our full reviews for Fire Marshal & Warden Training. Depending on the size and use of your premises, you must appoint one or more competent persons to carry out any of the preventive and protective measures required by The Regulatory Reform (Fire Safety) order 2005. A competent person is someone with adequate training, knowledge and experience to be able to implement these measures properly. A competent person must be appointed to carry out fire-fighting duties (where appropriate), contact the Emergency Services, and assist in evacuations. This person would typically be a Marshal or Warden. Failure to carry out these responsibilities may result in enforcement by the Enforcing Authority through the actions of an Inspector. Conviction for failing to comply may lead to a penalty consisting of a fine or up to two years’ imprisonment. Placeholder image for Are chrome fire extinguishers illegal? Are chrome fire extinguishers illegal? Placeholder image for Is smoking permitted in fire assembly areas? Is smoking permitted in fire assembly areas?